Any office, school or organisation wanting to commemorate the birth of a new page in England’s history. Slate is durable in all weather conditions and will be as at home indoors. The plaque is designed to be wall mounted although it would be equally attractive on a shelf. We provide fixings and pre drill holes for mounting if required. 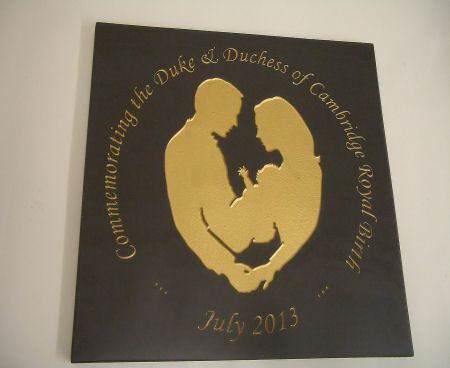 The engraved and painted design depicts Prince William and Katherine Middleton holding their newborn baby. The surrounding text, also engraved and painted. This plaque is available for the offer price of £125.00 + £6.00 postage and packing for UK mainland delivery. Contact us for other country delivery prices. Please ask us for a price if you require the plaque to be personalised to your company, school or office and we will supply a price based on the information you provide.